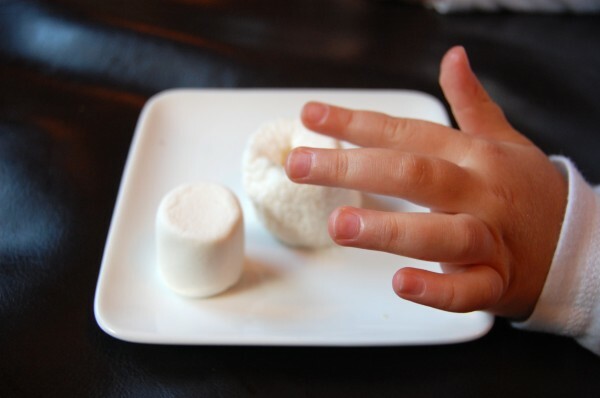 Have you heard of the microwave marshmallow experiment? 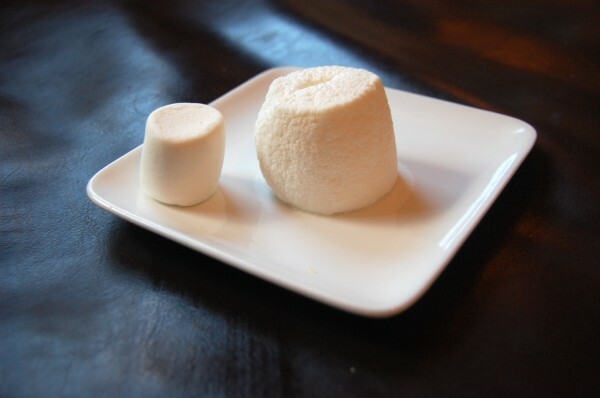 It’s really simple and a fun way to explore how the volume of gas expands a marshmallow as it heats up. 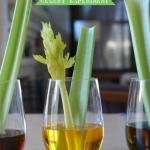 My kids also enjoy this experiment because it mixes science (+ fun) with a sugary treat. 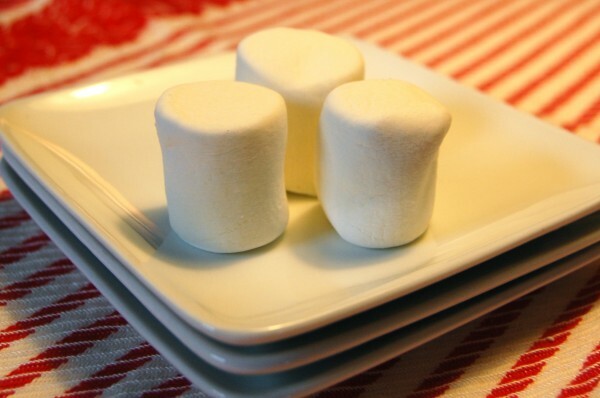 For this microwave marshmallow experiment, we’ll microwave three marshmallows for different periods of time, and then compare what happens to the marshmallows as they heat up, and then cool down again. 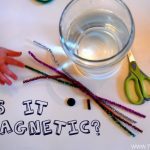 This is an engaging way to involve children in scientific observation and discovery, it raises lots of questions, and doesn’t require a lot of prep or clean-up. Are you with me? 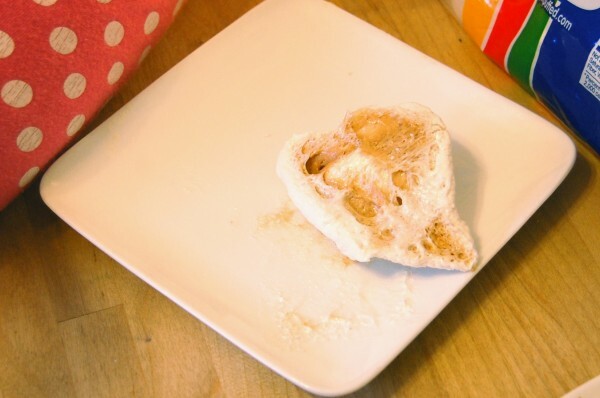 Microwave one marshmallow for 10 seconds and remove from the microwave. Compare it to an uncooked marshmallow and describe how it looks. How does it feel? Observation: It’s small, shorter than the other marshmallow, but fatter. It’s gooey. 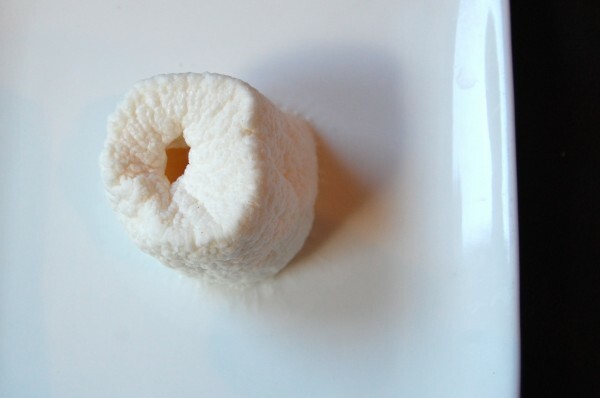 Microwave the second marshmallow for 30 seconds and remove it. How does it compare with an uncooked marshmallow? What happens to it as it cools? Observation: It’s a little bit larger than the other one. It got dry as it cooled. Cool, a little hole showed up in the middle after it cooled down a bit. Microwave the third marshmallow for 50 seconds and remove from the microwave. 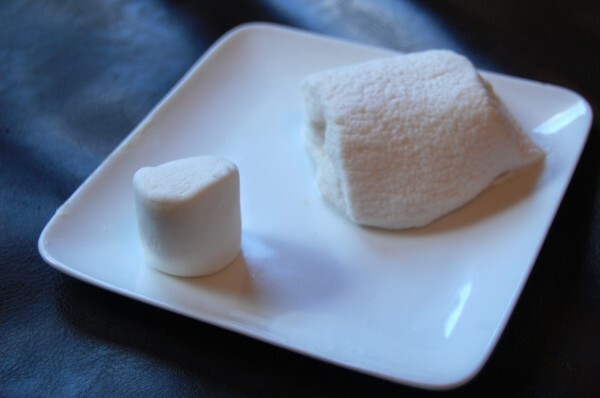 Compare to and uncooked marshmallow right away and after it cools. How are they different? How does this marshmallow feel? Observation: It’s huge and wrinkly and dry. It’s brown. That means it burned. That means it’s good to eat. Crunchy to eat. You can see all three marshmallows here. We noticed that the 30 second and 50 second marshmallows got hard and crunchy as they cooled, and N decided to taste them for a flavor comparison. The 50 second marshmallow was brown, crunchy, and caramelized. Have you ever tried astronaut ice cream? It had a similar texture. The science behind the activity is explained clearly over here at The Exploratorium. 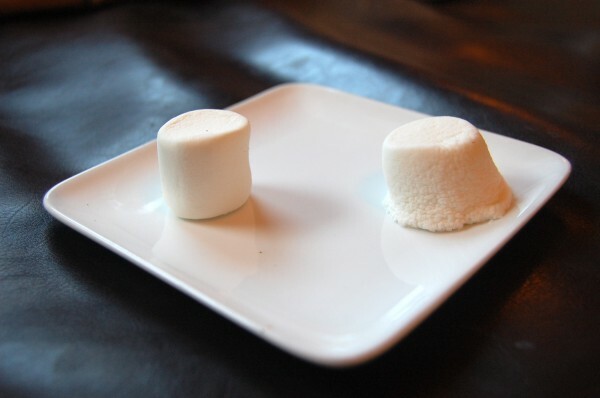 In essence, the volume of gas in the marshmallow increases when the temperature increases, and then decreases as it cools down. The Exploratorium suggests not microwaving marshmallows for longer than 2 minutes, less you want a dark, stinky, burnt mess on your hands. This project was inspired by a book we found at the library: Kitchen Science Experiments: How Does Your Mold Garden Grow? Have you ever microwaved anything and been surprised by the outcome? 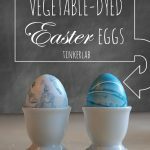 If you enjoyed this post, you might like to sign up for the weekly TinkerLab newsletter. It’s free and we often send exclusive content and opportunities that are only available to our subscribers. It would be a great way to fill in a gap in the day. That’s so awesome, Jen. 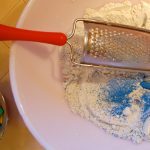 I remember experimenting with food in the kitchen too, but nothing came out all that delicious. 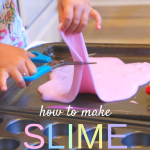 Just lots and lots of messy gooey concoctions. That’s funny that you still make it to this day. I can see the chocolate taking it up a notch! I’ve microwaved colored CDs before to make jewelry (alas, they are now scant). Â I also got the surprise of my life when my baked potato caught on fire. Â Don’t ask me how…. Â I’m not safe around most kitchen eqpt! Hilarious, Lucy. But wait, you put a CD (like the kind you listen to music on?) in the microwave? How does that work? Microwaving marshmallows has unintentionally become a tradition that the kids do each year at the cabin. 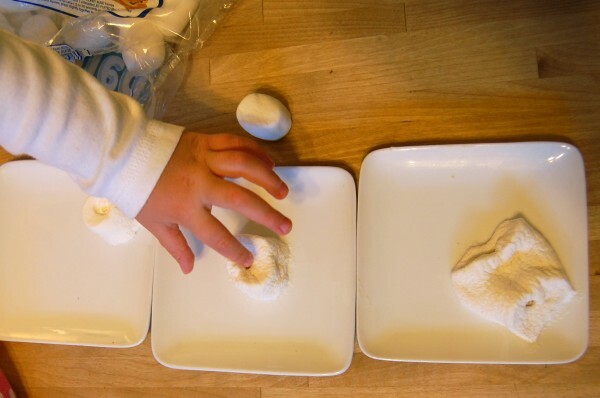 They experiment with all sorts of concoctions…rolling marshmallows around nuts and microwaving, trying to stir melted chocolate and marshmallows together, etc. 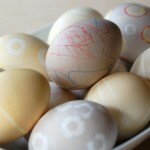 Isn’t it funny how some traditions begin? This is a good one, Amy, and I like the nuts addition. Gummy bears – they grow as well. Thanks for all the fun ideas. Gummy bears — YES! We’ll have to try that soon. Thanks for the suggestion, Karenda. 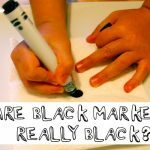 Loving your blog, Â Super cool ideas! Thanks Meg! I’m so glad you found me. 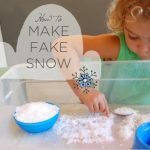 Sink or float is a favorite activity for our 3.5 year old during bath time!